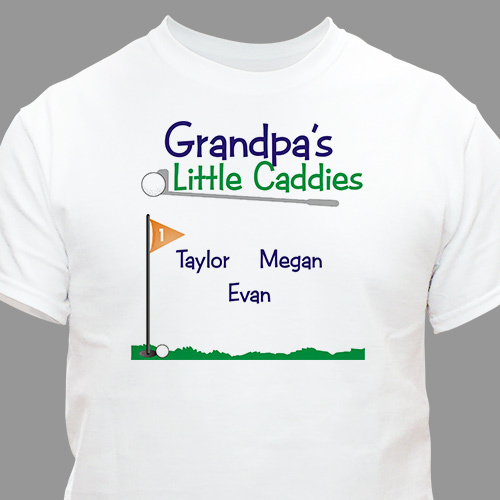 Always have your Little Caddies with you when you wear these Golfing Personalized T-Shirts at your favoirte golf course. Our Personalized T-Shirt for your favorite Golfer is Available on our premium white 100% cotton Personalized T-Shirt, machine washable in adult sizes S-3XL. This Golf Personalized Shirt is also available in Ash Gray. Golf shirt for Dad includes FREE personalization! Personalize your Little Caddies Golf Shirt with any title like Dad, Grandpa, Uncle Mike or create your own and up to 30 children or grandchildren's names. Customer service is great! They made a mistake on my T-shirt, but promptly responded and took care of it! Novelty golfer shirts makes an excellent Father's Day Gift ideas for Dad or Grandpa! Great gift ideas to give to Grandpa from the kids or grandkids! Personalized Golf sign - Perfect for your favorite 19th hole watering station!! Personalized Golf shirts - Our Personalized Golf shirts are perfect when shooting the back 9! All make great Fathers Day Gifts! !